The successful operation of an MV distribution system depends on the proper selection and setting of switchgear relays. Protective relays are arguably the least understood component of medium voltage (MV) circuit protection. In fact, somebelieve that MV circuit breakers operate by themselves, without direct initiation by protective relays. Others think that the operation and coordination of protective relays is much too complicated to understand. Let’s get into the details and eliminate these misbeliefs. A device designed to open and close a circuit by nonautomatic means, and to open the circuit automatically on a predetermined overload of current without injury to itself when properly applied within its rating. By this definition, MV breakers are not true circuit breakers, since they do not open automatically on overcurrent. They are electrically operated power-switching devices, not operating until directed by some external device to open or close. This is true whether the unit is an air, oil, vacuum, or [SF.sub.6] circuit breaker. Sensors and relays are used to detect the overcurrent or other abnormal or unacceptable condition and to signal the switching mechanism to operate. The MV circuit breakers are the brute-force switches while the sensors and relays are the brains that direct their functioning. The sensors can be current transformers (CTs), potential transformers (PTs), temperature or pressure instruments, float switches, tachometers, or any device or combination of devices that will respond to the condition or event being monitored. In switchgear application, the most common sensors are CTs to measure current and PTs to measure voltage. The relays measure sensor output and cause the breaker to operate to protect the system when preset limits are exceeded, hence the name “protective relays.” The availability of a variety of sensors, relays, and circuit breakers permits the design of complete protection systems as simple or as complex as necessary, desirable, and economically feasible. For many years, protective relays have been electromechanical devices, built like fine watches, with great precision and often with jeweled bearings. They have earned a well-deserved reputation for accuracy, dependability, and reliability. There are two basic types of operating mechanisms: the electromagnetic-attraction relay and the electromagnetic-induction relay. Magnetic attraction relays. Magnetic-attraction relays, have either a solenoid that pulls in a plunger, or one or more electromagnets that attract a hinged armature. When the magnetic force is sufficient to overcome the restraining spring, the movable element begins to travel, and continues until the contact(s) close or the magnetic force is removed. The pickup point is the current or voltage at which the plunger or armature begins to move and, in a switchgear relay, the pickup value can be set very precisely. These relays are usually instantaneous in action, with no intentional time delay, closing as soon after pickup as the mechanical motion permits. Time delay can be added to this type of relay by means of a bellows, dashpot, or a clockwork escapement mechanism. 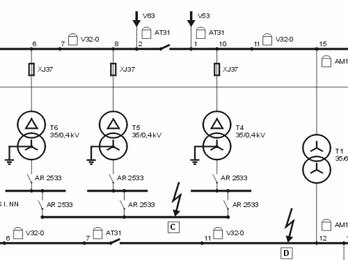 However, timing accuracy is considerably less precise than that of induction-type relays, and these relays are seldom used with time delay in switchgear applications. Attraction-type relays can operate with either AC or DC on the coils; therefore, relays using this principle are affected by the DC component of an asymmetrical fault and must be set to allow for this. Induction relays. Induction relays, are available in many variations to provide accurate pickup and time-current responses for a wide range of simple or complex system conditions. Induction relays are basically induction motors. The moving element, or rotor, is usually a metal disk, although it sometimes may be a metal cylinder or cup. The stator is one or more electromagnets with current or potential coils that induce currents in the disk, causing it to rotate. The disk motion is restrained by a spring until the rotational forces are sufficient to turn the disk and bring its moving contact against the stationary contact, thus closing the circuit the relay is controlling. The greater the fault being sensed, the greater the current in the coils, and the faster the disk rotates. A calibrated adjustment, called the time dial, sets the spacing between the moving and stationary contacts to vary the operating time of the relay from fast (contacts only slightly open) to slow (contacts nearly a full disk revolution apart). Reset action begins when the rotational force is removed, either by closing the relay contact that trips a breaker or by otherwise removing the malfunction that the relay is sensing. The restraining spring resets the disk to its original position. The time required to reset depends on the type of relay and the time-dial setting (contact spacing). With multiple magnetic coils, several conditions of voltage and current can be sensed simultaneously. Their signals can be additive or subtractive in actuating the disk. For example, a current-differential relay has two current coils with opposing action. If the two currents are equal, regardless of magnitude, the disk does not move. If the difference between the two currents exceeds the pickup setting, the disk rotates slowly for a small difference and faster for a greater difference. The relay contacts close when the difference continues for the length of time determined by the relay characteristics and settings. Using multiple coils, directional relays can sense direction of current or power flow, as well as magnitude. Since the movement of the disk is created by induced magnetic fields from AC magnets, induction relays are almost completely unresponsive to the DC component of an asymmetrical fault. Most switchgear-type relays are enclosed in a semiflush-mounting drawout case. Relays usually are installed on the door of the switchgear cubicle. Sensor and control wiring are brought to connections on the case. The relay is inserted into the case and connected by means of small switches or abridging plug, depending on the manufacturer. It can be disconnected and withdrawn from the case without disturbing the wiring. When the relay is disconnected, the CT connections in the case are automatically shorted to short circuit the CT secondary winding and protect the CT from overvoltages and damage. Many relays are equipped with a connection for a test cable. This permits using a test set to check the relay calibration. The front cover of the relay is transparent, can be removed for access to the mechanism, and has provisions for wire and lead seals to prevent tampering by unauthorized personnel. Recently, solid-state electronic relays have become more popular. These relays can perform all the functions that can be performed by electromechanical relays and, because of the versatility of electronic circuitry and microprocessors, can provide many functions not previously available. In general, solid-state relays are smaller and more compact than their mechanical equivalents. For example, a 3-phase solid-state overcurrent relay can be used in place of three single-phase mechanical overcurrent relays, yet is smaller than one of them. The precision of electronic relays is greater than that of mechanical relays, allowing closer system coordination. In addition, because there is no mechanical motion and the electronic circuitry is very stable, they retain their calibration accuracy for a long time. Reset times can be extremely short if desired because there is no mechanical motion. Electronic relays require less power to operate than their mechanical equivalents, producing a smaller load burden on the CTs and PTs that supply them. Because solid-state relays have a minimum of moving parts, they can be made very resistant to seismic forces and are therefore especially well suited for areas susceptible to earthquake activity. In their early versions, some solid-state relays were sensitive to the severe electrical environment of industrial applications. They were prone to failure, especially from high transient voltages caused by lightning or utility and on-site switching. However, today’s relays have been designed to withstand these transients and other rugged application conditions, and this type of failure has essentially been eliminated. Solid-state relays have gained a strong and rapidly growing position in the marketplace as experience proves their accuracy, dependability, versatility, and reliability. The information that follows applies to electromechanical and solid-state relays, although one functions mechanically and the other electronically. Significant differences will be pointed out. There are literally hundreds of different types of relays. The catalog of one manufacturer of electromechanical relays lists 264 relays for switchgear and system protection and control functions. For complex systems with many voltage levels and interconnections over great distances, such as utility transmission and distribution, relaying is an art to which some engineers devote their entire careers. For more simple industrial and commercial distribution, relay protection can be less elaborate, although proper selection and application are still very important. The most commonly used relays and devices are listed HERE in the Table by their American National Standards Institute (ANSI) device-function number and description. These standard numbers are used in one-line and connection diagrams to designate the relays or other devices, saving space and text. Where a relay combines two functions, the function numbers for both are shown. The most frequently used relay is the overcurrent relay, combining both instantaneous and inverse-time tripping functions. This is designated device 50/51. As another example, device 27/59 would be a combined undervoltage and overvoltage relay. The complete ANSI standard lists 99 device numbers, a few of which are reserved for future use. Relays can be classified by their operating-time characteristics. Instantaneous relays are those with no intentional time delay. Some can operate in one-half cycle or less; others may take as long as six cycles. Relays that operate in three cycles or less are called high-speed relays. Time-delay relays can be definite-time or inverse-time types. Definite-time relays have a preset time delay that is not dependent on the magnitude of the actuating signal (current, voltage, or whatever else is being sensed) once the pickup value is exceeded. The actual preset time delay is usually adjustable. Inverse-time relays, such as overcurrent or differential relays, have operating times that do depend on the value of actuating signal. The time delay is long for small signals and becomes progressively shorter as the value of the signal increases. The operating time is inversely proportional to the magnitude of the event being monitored. In switchgear application, an overcurrent relay usually is used on each phase of each circuit breaker and often one additional overcurrent relay is used for ground-fault protection. Conventional practice is to use one instantaneous short-circuit element and one inverse-time overcurrent element (ANSI 50/51) for each phase. In the standard electromechanical relay, both elements for one phase are combined in one relay case. The instantaneous element is a clapper or solenoid type and the inverse-time element is an induction-disk type. In some solid-state relays, three instantaneous and three inverse-time elements can be combined in a single relay case smaller than that of one induction-disk relay. Overcurrent relays respond only to current magnitude, not to direction of current flow or to voltage. Most relays are designed to operate from the output of a standard ratio-type CT, with 5A secondary current at rated primary current. A solid-state relay needs no additional power supply, obtaining the power for its electronic circuitry from the output of the CT supplying the relay. On the instantaneous element, only the pickup point can be set, which is the value of current at which the instantaneous element will act, with no intentional time delay, to close the trip circuit of the circuit breaker. The actual time required will decrease slightly as the magnitude of the current increases, from about 0.02 sec maximum to about 0.006 sec minimum, as seen from the instantaneous curve. This time will vary with relays of different ratings or manufacturers and also will vary between electromechanical and solid-state relays. Time delays can be selected over a wide range for almost any conceivable requirement. Time-delay selection starts with the choice of relay. There are three time classifications: standard, medium, and long time delay. Within each classification, there are three classes of inverse-time curve slopes: inverse (least steep), very inverse (steeper), and extremely inverse (steepest). The time classification and curve slopes are characteristic of the relay selected, although for some solid-state relays these may be adjustable to some degree. For each set of curves determined by the relay selection, the actual response is adjustable by means of the time dial. On the inverse-time element, there are two settings. First the pickup point is set. This is the value of current at which the timing process begins as the disk begins to rotate on an electromechanical relay or the electronic circuit begins to time out on a solid-state relay. Next the time-dial setting is selected. This adjusts the time-delay curve between minimum and maximum curves for the particular relay. A given relay will have only one set of curves, either inverse, very inverse, or extremely inverse, adjustable through the full time-dial range. Note that the current is given in multiples of pickup setting. Each element, instantaneous or time delay, has a flag that indicates when that element has operated. This flag must be reset manually after relay operation. The standard overcurrent relay is designed to operate from a ratio-type CT with a standard 5A secondary output. The output of the standard CT is 5A at the rated nameplate primary current, and the output is proportional to the primary current over a wide range. For example, a 100/5 ratio CT would have a 5A output when the primary current (the current being sensed and measured) is 100A. This primary-to-secondary ratio of 20-to-1 is constant so that for a primary current of 10A, the secondary current would 0.5A; for 20A primary, 1.0A secondary; for 50A primary, 2.5A secondary; etc. For 1000A primary, the secondary current is 50A, and similarly for all values of current up to the maximum that the CT will handle before it saturates and becomes nonlinear. The first step in setting the relay is selecting the CT so that the pickup can be set for the desired primary current value. The primary current rating should be such that a primary current of 110 to 125% of the expected maximum load will produce the rated 5A secondary current. The maximum available primary fault current should not produce more than 100A secondary current to avoid saturation and excess heating. It may not be possible to fulfill these requirements exactly, but they are useful guidelines. As a result, some compromise may be necessary. On the 50/51 overcurrent relay, the time-overcurrent-element (device 51) setting is made by means of a plug or screw inserted into the proper hole in a receptacle with a number of holes marked in CT secondary amperes, by an adjustable calibrated lever or by some similar method. This selects one secondary current tap (the total number of taps depends on the relay) on the pickup coil. The primary current range of the settings is determined by the ratio of the CT selected. For example, assume that the CT has a ratio of 50/5A. Typical taps will be 4, 5, 6, 7, 8, 10, 12, and 16A. The pickup settings would range from a primary current of 40A (the 4A tap) to 160A (the 16A tap). If a 60A pickup is desired, the 6A tap is selected. If a pickup of more than 160A or less than 40A is required, it would be necessary to select a CT with a different ratio or, in some cases, a different relay with higher or lower tap settings. Various types of relays are available with pickup coils rated as low as 1.5A and as high as 40A. Common coil ranges are 0.5 to 2A, for low-current pickup such as ground-fault sensing; 1.5 to 6A medium range; or 4 to 16A, the range usually chosen for overcurrent protection. CTs are available having a wide range of primary ratings, with standard 5A secondaries or with other secondary ratings, tapped secondaries, or multiple secondaries. A usable combination of CT ratio and pickup coil can be found for almost any desired primary pickup current and relay setting. The instantaneous trip (device 50) setting is also adjustable. The setting is in pickup amperes, completely independent of the pickup setting of the inverse-time element or, on some solid-state relays, in multiples of the inverse-time pickup point. For example, one electromechanical relay is adjustable from 2 to 48A pickup; a solid-state relay is adjustable from 2 to 12 times the setting of the inverse-time pickup tap. On most electromechanical relays, the adjusting means is a tap plug similar to that for the inverse-time element. With the tap plug, it is possible to select a gross current range. An uncalibrated screw adjustment provides final pickup setting. This requires using a test set to inject calibration current into the coil if the setting is to be precise. On solid-state relays, the adjustment may be a calibrated switch that can be set with a screwdriver. For any given tap or pickup setting, the relay has a whole family of time-current curves. The desired curve is selected by rotating a dial or moving a lever. The time dial or lever is calibrated in arbitrary numbers, between minimum and maximum values, as shown on curves published by the relay manufacturer. At a time-dial setting of zero, the relay contacts are closed. As the time dial setting is increased, the contact opening becomes greater, increasing relay operating time. Settings may be made between calibration points, if desired, and the applicable curve can be interpolated between the printed curves. The pickup points and time-dial settings are selected so that the relay can perform its desired protective function. For an overcurrent relay, the goal is that when a fault occurs on the system, the relay nearest the fault should operate. The time settings on upstream relays should delay their operation until the proper overcurrent device has cleared the fault. A selectivity study, plotting the time-current characteristics of every device in that part of the system being examined, is required. With the wide selection of relays available and the flexibility of settings for each relay, selective coordination is possible for most systems. Selecting and setting other than overcurrent relays are done in similar fashion. Details will vary, depending on the type of relay, its function in the system, and the relay manufacturer. An electromechanical relay will pick up and start to close its contacts when the current reaches the pickup value. At the inverse-time pickup current, the operating forces are very low and timing accuracy is poor. The relay timing is accurate at about 1.5 times pickup or more, and this is where the time-current curves start. This fact must be considered when selecting and setting the relay. When the relay contacts close, they can bounce, opening slightly and creating an arc that will burn and erode the contact surfaces. To prevent this, overcurrent relays have an integral auxiliary relay with a seal-in contact in parallel with the timing relay contacts that closes immediately when the relay contacts touch. This prevents arcing if the relay contacts bounce. This auxiliary relay also activates the mechanical flag that indicates that the relay has operated. When the circuit breaker being controlled by the relay opens, the relay coil is deenergized by an auxiliary contact on the breaker. This protects the relay contacts, which are rated to make currents up to 30A but should not break the inductive current of the breaker tripping circuit, to prevent arcing wear. The disk is then returned to its initial position by the spring. The relay is reset. Reset time is the time required to return the contacts fully to their original position. Contacts part about 0.1 sec (six cycles) after the coil is deenergized. The total reset time varies with the relay type and the time-dial setting. For a maximum time-dial setting (contacts fully open), typical reset times might be 6 sec for an inverse-time relay and up to 60 sec for a very inverse or extremely inverse relay. At lower time-dial settings, contact opening distance is less, therefore reset time is lower. A solid-state relay is not dependent on mechanical forces or moving contacts for its operation but performs its functions electronically. Therefore, the timing can be very accurate even for currents as low as the pickup value. There is no mechanical contact bounce or arcing, and reset times can be extremely short. In selecting instrument transformers for relaying and metering, a number of factors must be considered; transformer ratio, burden, accuracy class, and ability to withstand available fault currents. CT ratio. CT guidelines mentioned earlier are to have rated secondary output at 110 to 125% of expected load and no more than 100A secondary current at maximum primary fault current. Where more than one CT ratio may be required, CTs with tapped secondary windings or multi-winding secondaries are available. CT burden. CT burden is the maximum secondary load permitted, expressed in voltamperes (VA) or ohms impedance, to ensure accuracy. ANSI standards list burdens of 2.5 to 45VA at 90% power factor (PF) for metering CTs, and 25 to 200VA at 50% PF for relaying CTs. CT accuracy class. ANSI accuracy class standards are [+ or -] 0.3, 0.6, or 1.2%. Ratio errors occur because of [I.sup.2]R heating losses. Phase-angle errors occur because of magnetizing core losses. CTs are marked with a dot or other polarity identification on primary and secondary windings so that at the instant current is entering the marked primary terminal it is leaving the marked secondary terminal. Polarity is not required for overcurrent sensing but is important for differential relaying and many other relaying functions. PT ratio. PT ratio selection is relatively simple. The PT should have a ratio so that, at the rated primary voltage, the secondary output is 120V. At voltages more than 10% above the rated primary voltage, the PT will be subject to core saturation, producing voltage errors and excess heating. PT burden. PTs are available for burdens from 12.5VA at 10% PF to as high as 400VA at 85% PF. PT accuracy. Accuracy classes are ANSI standard [+ or -] 0.3, 0.6, or 1.2%. PT primary circuits, and where feasible PT secondary circuits as well, should be fused. CTs and PTs should have adequate capacity for the burden to be served and sufficient accuracy for the functions they are to perform. 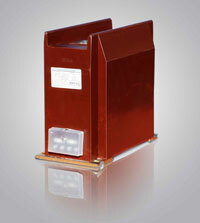 However, more burden or accuracy than necessary will merely increase the cost of the metering transformers. Solid-state relays usually impose lower burdens than electromechanical relays.